The Pepper Wreck was tentatively identified as the Portuguese Indiaman Nossa Senhora dos Mártires, lost at São Julião da Barra in September 1606, during a storm, at the end of its return trip from India. Beam: Estimated 12.32 m, based on the measurement of the flat of the floor amidships (4.11 m) and Fernando Oliveira’s recipe to build 600 tons Indiamen. Number of Masts: Three plus bowsprit. 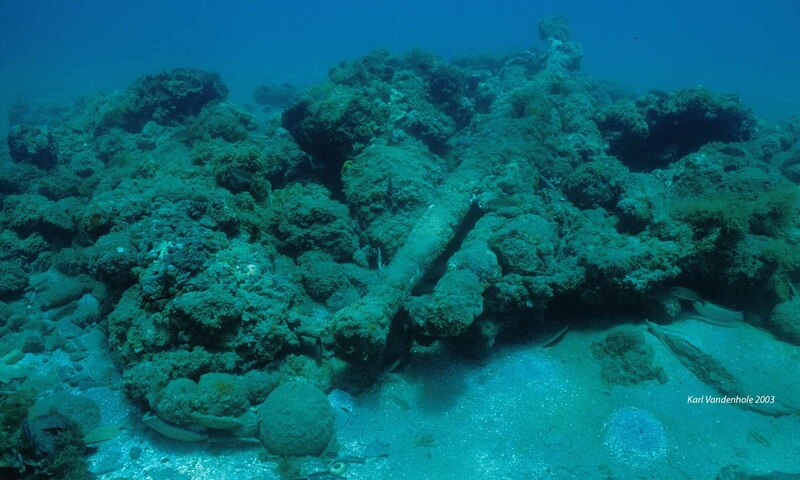 This shipwreck was excavated by a joint team from the Portuguese Museu Nacional de Arqueologia and Texas A&M University / Institute of nautical Archaeology, under the direction of Francisco Alves and Filipe Castro. Found in 1993 off the rocks of the fortress São Julião da Barra, at the mouth of the Tagus River, the SJB2 shipwreck—or Pepper Wreck—was tentatively identified as the Portuguese Indiaman Nossa Senhora dos Mártires, lost at this location on its return voyage from Cochin, in India, on 14 September 1606. Its archaeological excavation disclosed a collection of artefacts from the late 16th and the early 17th centuries and allowed the study of the surviving hull structure. The evidence suggests that the Pepper Wreck was a typical Portuguese Indiaman, similar to those described in Portuguese 16th century ship treatises, with a keel of around 27.7 m and an overall length of nearly 40 m (Castro 2003, 2005a, 2005b). This nau was probably completed and launched in 1605 at the Ribeira das Naus, the royal shipyard in Lisbon, and left for India under captain Manuel Barreto Rolim, in the armada of that same year. The shipwreck was excavated from 1996 to 2001 and the artifact collection conserved. Part of the timbers were reburied on the site and a number were raised and are kept in the headquarters of the Portuguese state agency for nautical and maritime archaeology: Direção Geral do Património Cultural (DGPC) / Divisão de Arqueologia Náutica e Subaquática (DANS). Some of the artifacts were exhibited in the world fair Expo’98, in Lisbon, and are now in Lisbon’s Museu de Marinha. The artifact collection, which included an astrolabe dated to 1605, the year of the departure of this ship, and the historical accounts suggest that this is the India nau Nossa Senhora dos Mártires, lost in 1606. Several documents describe the loss of this ship (Afonso 1998, Castro 2005). It arrived on the Portuguese coast under a heavy storm, anchored at Cascais, hoping for the weather to improve so that it could be towed by a galley but ended up trying to enter the Tagus River mouth as the wind was strong enough to prevent the ship to be dragged into the rocks. the wind fell, however, in front of the fortress of São Julião da Barra and the nau was dragged into the rocks, breaking and releasing a black tide of peppercorns that floated up and down the coast for several days. A manuscript account of this ship’s loss, Perdição das naus, e das que se salvaram na barra de Lisboa no anno de 1606, authored by D. João Soares de Alarcão (c. 1580-1618), is lost. This site was known from sport divers for many years, but the shipwreck remains were shown to the National Museum team in 1993 by Carlos Martins, who donated a collection of over 2,000 artifacts to the national Museum at the time. The site was heavily salvaged after the shipwreck, forgotten, and probably covered by sediments. several large rocks were rolled into the site by storms, or possibly by the 1755 tsunami. The fortress was expanded, and a swimming pool was built over part of the site. In 1968 a trawler named Santa Mafalda sunk over the Pepper Wreck site. There are references to more shipwrecks in this area and we found artefacts that attest this hypothesis. The area designated SJB2 in the São Julião da Barra complex consisted of the remains of a wooden hull and associated shards of Ming porcelain and Chinese earthenware dating from the late 16th or early 17th centuries. This archaeological site encompassed a large area strewn with lead straps and pottery shards over a layer of small pebbles and peppercorns. It was composed of the remains of a vessel located approximately 200 m from the fortress of São Julião da Barra, at 9 meters of depth measured at high tide. The wooden structure was enclosed in a natural depression of the rocky bottom, sheltered by a small crest of rocks which extends north and west. A slight slope towards the south was filled by sediment. The hull remains rested on a layer of small pebbles with diameters between 8 and 15 cm and was embedded in a thick mire of peppercorns and pebbles with very few artifacts. The planking was separated from the frames and rested on the bottom, molded to its shape rather than to the shape of the lower face of the frames, as we were to find when we took profiles of it. There was no ballast on this portion of the shipwreck site. It is probable that the ballast was loaded in the area, as apart from a small number of granite stones, most pebbles were characteristic from the Tagus mouth area. Several anchors were found in this area and it is difficult to establish which belong to the pepper Wreck. The most probably associated was found near the hull remains. One bronze and one iron gun were found near the site. The bronze gun was signed by the Flemish founder Remigy de Halut. Numerous iron concretions were found concreted to the bedrock, but none was raised. A reconstruction was attempted, based on a set of proportions dated to circa 1580 and described in a shipbuilding manuscript by Fernando Oliveira. As reconstructed this ship would be a typical 600 ton burden Portuguese Indiaman of the period (Castro and Fonseca 2006; Castro 2009, 2013; Santos et al. 2012). Preliminary analysis suggested that the keel, frames, and apron were of cork oak (Quercus suber) and the hull planks of stone pine (Pinus pinea). A portion of the bottom of the ship was preserved, including a section of the keel, an apron, eleven frames, and planking extending over an area measuring 7 x 12 m. Construction marks suggest this was a portion of the ship’s bottom immediately forward of the midship frames. Scantlings closely fitted the units in use in Portuguese shipyards during this period. The keel was 25 cm wide, roughly 1 palmo de goa (256.7 mm), and was not preserved to its full depth. A bolt preserved underneath suggested a maximum depth of 46 cm. Floor timbers were 25 cm sided, again about 1 palmo de goa, and 25 cm molded at their extremities. The futtocks were 22 cm square, the measure of 1 palmo de vara, and were fastened to the forward face of the floors with three or four double-clenched iron spikes, inserted from the floors timber’s side. Construction marks inscribed on the surfaces of the floor timbers indicated the keel axis and keel sides, the turn of the bilge, and the number of each floor over the keel (in Roman numerals). Twenty-eight strakes of planking were preserved. The planking was 11 cm thick and 20 to 35 cm wide. Spike marks on the planking indicated the position of a total of 25 frames. All fasteners were made of iron. Spikes □ = 20-25 mm fastened the floor timbers to the keel and apron, the futtocks to the floors, and with □ = 16-18 mm the planking to the frames. Bolts Ø = 35-40 mm with round heads fastened the keel to the keelson, inserted from below. A treenail was found on the fore face of three of the floor timbers, cut flush with the surface. Their positions and the fact that they were flush with the surface suggest that these treenails may be related to the process of construction, rather than any type of permanent fastener. The abundance of cultural materials found here determined the excavation of an area of around 100 m2 that produced an important collection of artefacts. Among these were three astrolabes, of which two were found together with two dividers in an area of around 10 m2. One of these astrolabes bore the date 1605 and the maker’s mark of the famous Goes’ family workshop in Lisbon (Budsberg et al. 2016). A stack of seven porcelain dishes still with a layer of straw in between each and an iron gun that accreted the shards missing from a large porcelain platter fragment found nearby, were among many finds, including pewter plates, green and yellow Chinese glazed earthenware, Martaban stoneware, lead shot and cannonballs. Budsberg, N., Jobling, J., and Castro, F., 2016. “Rio Grande do Norte Astrolabe” International Journal of Historical Archaeology 20.2 :405-421. Castro, F., “The Pepper Wreck”, 2003. International Journal of Nautical Archaeology, 32.1: 6-23. Castro, F., The Pepper Wreck, 2005a. College Station: Texas A&M University Press. Castro, F., 2005b. “Rigging the Pepper Wreck. Part I: Masts and Yards”, International Journal of Nautical Archaeology, 34.1:112-124.